Our dangling Breeze catcher: one of two projects in our book that displays the layering technique step by step. 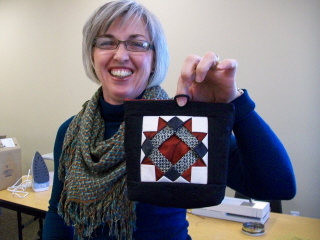 Happy class member with her folded block set into a black denim purse, a 3-hour workshop. Calculating and testing block patterns is a challenging and time-consuming process. 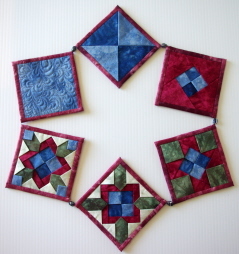 happily include a selection of alternate blocks in future patterns. 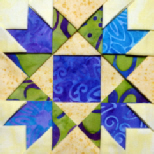 So if there’s a block you’d like to see folded or resized, please let us know. We’ll add it to our growing list!